Detail from a Rochester Lithographing and Printing Co. letter to William A. Brodie, 28 March 1890 (click on image to see the full document). This fleeting encounter between agriculture and the technology of lithographic reproduction occurred at a time when the meaning of food was changing: increasingly, our relationship to the farm was mediated by images and name-brands. Courtesy of Wadsworth Family Collection, Milne Library. 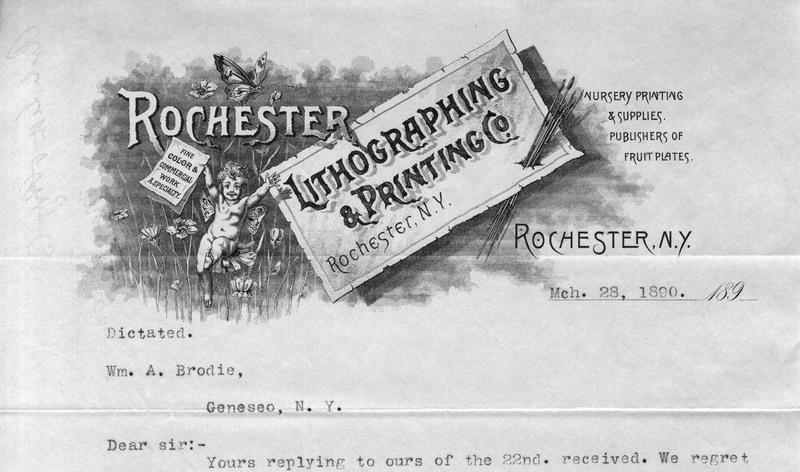 On March 28, 1890 a representative from Rochester Lithographing and Printing wrote to William A. Brodie, business overseer of the Wadsworth family estate, concerning an order of labels. While their intended purpose isn’t clear, mention of the Judson Co.—which specialized in pre-printed labels for nurserymen—suggests that the Wadsworths may have purchased them for the sale of specimen plants, fruit trees, or some other stock they were growing. It appears to have been a freestanding venture comparable to their cattle breeding, Avon grist mill, or Ashantee Creamery. The family’s primary occupation, of course, was managing land holdings whose tenants included numerous farmers. This particular letter is chosen to illustrate an important development of the later 19th century: the collision of traditional agriculture with an industrial food system that increasingly branded its output. Meat, produce, and plant stock purchased from nearby neighbors (or grown for one’s own use) had little need of elaborate printed labels because its source and grower’s reputation were known. Links between farm and table became increasingly complex, however, with the rise of far-flung transportation systems and the advent of processed food; over time, the relationship became mediated through images. Local historian Karl Kabalac identifies one early site of this transformation: the chromolithographic prints of fruit and flowers carried by nursery salesmen to illustrate their wares during the 1870s and ‘80s. Dellon Marcus Dewey, who merged his business with Rochester Lithographing and Printing company in the late 1880s, was a creator of these lush images before they were widely distributed in catalogues sent by mail. Alongside the development of printed fruit plates, catalogues, and seed card packets were fruit crate labels (the only to know who grew your Florida oranges) and early name-brands like Shredded Wheat—“The Niagara Falls Cereal” that debuted at the World’s Columbian Exposition in 1893. Lithography and food seem to have little connection unless we look carefully. Tracing the history of Wadsworth family commercial correspondence, from the 1860s into the early 20th century, there are subtle visual changes that turn out to be important. Handwritten notes gradually give way to typed letters; small sheets of blank paper grow into formal company letterhead, often decorated by elaborate logos or engraved images. The geographical range of correspondents expands beyond the Genesee Valley. These graphical changes were occurring alongside geographical ones in agriculture, both of which transformed the meaning of food. — Kabelac, Karl Sanford. “Nineteenth-Century Rochester Fruit and Flower Plates.” University of Rochester Library Bulletin 35 (1982). Web.